We hope everyone had a wonderful Christmas. This month we are busy seeing brides and organising this year’s weddings calendar. July and August are already quite full (especially Saturdays) – dates are still available for June though. Don’t forget to order your Valentines flowers early and take advantage of our free fresh rose petals with each order (online orders only). 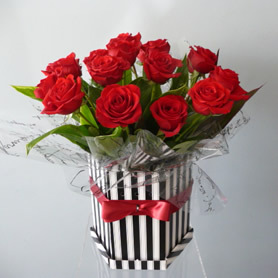 Our prices are the same as last year, our roses are top quality and large headed- they can’t fail to impress!